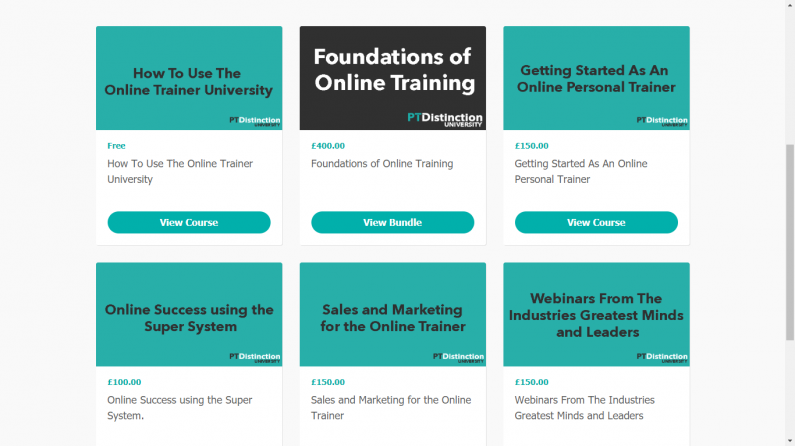 All the great online personal trainers that are members of PT Distinction get free access to every course and module in the PT Distinction Online Trainer University. The University teaches you everything you need to know to become a highly successful online trainer. Here's how you can access the Online Trainer University for free. Login to PT Distinction and scroll down to the PT Distinction University icon. Clicking on that will open up a window with your voucher code. Copy that voucher code and click the "Go" button where it'll take you through to the university dashboard. Once you're on the university dashboard, pick the course or bundle that you want to do (I recommend starting with the foundations of online training), click on the buy button, complete your details, click agree to terms and conditions and hit sign up. Once you've hit sign up, head up to the little logo that says “have a coupon?”, insert the coupon code, hit apply and you'll get a 100% discount. Then hit "Enrol now" and you're ready to start learning in the PT Distinction University. To get free access to the PT Distinction University grab a free trial of PT Distinction here.